She ducks responsibility for the deaths of 133 of Maine's 'most vulnerable citizens' on her watch – and more. Forget about her incompetence. Mary Mayhew just descended to downright disgusting. “There is nothing more important than the health and well-being of our most vulnerable citizens,” the former head of the Maine Department of Health and Human Services, now a Republican candidate for governor, said Thursday in response to a federal audit that should leave all of Maine hanging its head in shame. The report by the Office of the Inspector General lays out, sometimes in chilling narrative, how 133 of those “most vulnerable citizens” died on Mayhew’s watch. “Therefore, Maine failed to demonstrate that it has a system to ensure the health, welfare, and safety of the 2,640 Medicaid beneficiaries with developmental disabilities,” concluded the audit team. Right. It’s all John Baldacci’s and Angus King’s fault. Translation: We count dollars, not dead people. 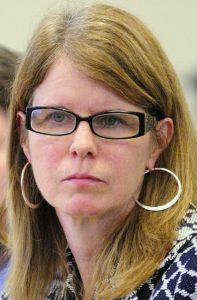 And never, not once, in her 104-word communique did Mayhew apologize or accept so much as a sliver of responsibility for her utter ineptitude atop Maine’s most vital government operation. Cleaned up significant problems? Mayhew, who spent all those years perfecting her skills at dodge ball, was the most significant problem. This is no longer a politician putting lipstick on her prize pig. This is an obscenity. As is the response that came from DHHS after the release of the audit. “We are proud that we have successfully made improvements since the audit period,” the department said in a statement under the letterhead of acting Commissioner Ricker Hamilton. A word of advice for whoever crafted this piece of artful deflection: When a team of federal investigators charge you with routinely ignoring the deaths of people you’re supposed to be keeping safe, simply decency would dictate that you avoid using the word “proud” in your rebuttal. And if you’re going to toss around the word “vulnerable,” you might at least pause long enough to consider what it truly means. It means these people are susceptible to harm, that they need protection – and when they don’t get it, they need someone in a position of authority to dig deeply into what happened and why. What they don’t need are excuses that are as hollow as they are morally repugnant. “The Department expressed to OIG that this is a complex system with many programs working together to assist and protect a vulnerable population and that the OIG’s approach did not capture all of the necessary data,” read the DHHS statement. To the contrary, the Office of the Inspector General captured more than enough data to demonstrate that DHHS failed miserably to ensure that all critical incidents were reported, to analyze those reports to see what trends might exist and, most importantly, to use that information to prevent these nightmares from recurring. As for it all being such a “complex system,” cry me a river. Yes, enabling Maine’s developmentally disabled citizens to live in the community rather than behind locked doors is a complicated undertaking. We get that. But using that as a cudgel to attack the messenger isn’t a fair and legitimate response. It’s grasping at straws – a reflex reaction by the entire LePage administration whenever its lofty rhetoric dissolves in a flash flood of cold reality. One can’t help but wonder how long Mayhew has seen this coming. When she announced her candidacy for governor two months ago, she took a shot at fellow Republican Sen. Susan Collins for supporting the long-overdue expansion of Medicaid, known as MaineCare here. Perhaps, sometime between now and the Republican primary next June, she might explain those “difficult decisions” to the family of the 57-year-old MaineCare “beneficiary” who went to the dentist for a cleaning and ended up having six teeth extracted. Five days. If it were your family member, Ms. Mayhew, how long would you have waited? Meaning nobody bothered to ask how a routine trip to the dentist somehow resulted in what was dismissed by DHHS as death from “complication to illness.” Or how such a tragedy might be prevented in the future. Neglect, injury and death, after all, don’t play so well on the conservative dog whistle. So go ahead, Mary Mayhew, keep patting yourself on the back. Run for governor to your heart’s content. But don’t think for a minute you can hide.